It feels so good to be sitting here in front of my computer this morning. For the past four months I’ve been playing grandma to my granddaughter and travel companion to my hubby. What an awesome, busy, whirlwind of a life I’ve experienced these past few months. Starting the summer off in late May my nephew, Luke marries his high school sweetheart, and another nephew, Wesley announces he and his lovely wife are going to be proud new parents in late October. Not to mention my niece, Andi tells us she will be delivering a little girl in January. (My family has been busy.) Then Emma is out of school for the summer and we’re off to the beach for a week. From there I’ve had book events at Rockford General Store, High Country Festival of the Book. Then the really crazy side of me takes over my common sense and I’m riding a dozen or so roller coasters at Carowinds Amusement Park. Finally my good sense kicks back in and I’m back to work peddling books at festivals in China Grove and Sparta. My granddaughter is not one to sit idly by so before the grass can grow under our feet we are off to Dollywood in the beautiful Smoky Mountains of Tennessee riding more roller coasters. Before we catch our breath it was time for Emma to go back to school. The crazy didn’t stop there. Back in January the hubby and I started planning another trip out west. Jerry only had five more states to visit to have been in all fifty. So our quest began to pass through Kansas, Oregon, Utah, Nevada, and Arizona. On a pitch-black morning on September 2nd our adventure began, seventeen days and nights of exploring the world. It was a wonderful trip. We saw some amazing handy work that the Lord created for us to enjoy. I have tons of stories to tell you, but you’ll have to wait because this blog is going to shift to another subject, my new novel, The River Keeper. While on our trip the design department at my publishing company, Ambassador International was hard at work designing the interior of The River Keeper. My trip wasn’t all fun and games. I had to go through the book three times while away, making minor changes and approving interior design. Then it was time for the publisher to get to work on the front cover. I was so excited. Before I left I had taken dozens of pictures of my granddaughter, Emma for them to use on the cover. I fashioned the main character of the book, Callie Mae McCauley to look like my Emma. Then an awful thing happened, the designer emailed me and told me that the quality of my photos was not high enough in resolution to use on the cover. Okay, here I am 2000 miles from home, what am I to do? Where there is a will, there is always a way. I call my daughter and ask her if she knows anyone with a really good camera that could take more pictures of Emma and email them to the publisher. She says, yes, her friend Cindy has a nice camera. Things are looking up. New pictures are taken; all is well in the world… until, my daughter texts me and says she is not able to email the new pictures in a high enough resolution. But, I have a very smart daughter. Wendy soon replies, why can’t I put the pictures on a CD and overnight it to the design department at Ambassador International? I answer, yes, why can’t you. And so the CD is mailed and all the next day while riding down the highway of life I anxiously await an email from the designer telling me the new pictures will work. Long about 4 o’clock that afternoon I get the email, it reads, “All the pictures are great quality, I should have you a cover to review very soon with Emma’s picture on it.” Low and behold the next day I get an email and attached is the cover of my dreams. I was almost in tears. My beautiful granddaughter, Emma was right there on the cover of my new novel. I’ve not been that happy in a long time. This new novel is very special to me. All who know me know that I am in love with the New River. It is a magical place for me to run and hide, or sometimes find myself. When the world is overpowering the wonderful things in life I can stand out on my porch that overlooks that great river and breathe a little calmer. I can smell the misty vapors of an early morning fog and hear the bass jump out of the water. The river whispers sweet nothings in my ear. 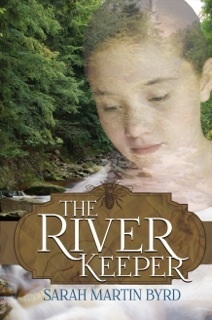 The River Keeper is full of my own heart felt feelings about the river and is loaded with historical facts concerning the second oldest river in the world. I am so excited to be able to unveil the new cover to you today. Hopefully the book will be released by mid-October. The definite date has not yet been set, but I’ll keep you informed. I also want to treat you to the first few pages of The River Keeper. Keep in mind this novel is written in mountain dialect. Hope you enjoy. I was born at Mouth of Wilson, Virginia, on a piece of land right past where the north and south branches of the New River join up. My years on that stretch of land are numbered almost eight. The spring flood of 1940 was the highest flood on record; it changed everything, especially who I was. It even changed who I am to become. The rain started yesterday ’bout the time Ma set dinner on the table. Not just a shower. It’s like God might be dumping out the wash water. This morning it’s a-pounding down even harder on this tin above my head. Sounds like somebody is a-peppering it with buckshot. I throw back the patchwork quilt that Aunt Pearlie gave to Ma on her wedding day. That quilt has laid over me all the nights of my memory. It’s made out of every color piece of cloth—plaid, paisley, and solid—that Aunt Pearlie ever owned. Ma is nigh on twenty years younger than Aunt Pearlie. Ma is what everybody calls a late-in-life baby, one what weren’t supposed to be. Ma always says Aunt Pearlie is more like a mama than a sister to her. I can’t wait to get outside and stomp around in them rain puddles. My toes is a-itching to be in the mud. At the door I reach up and pull down Pa’s old slicker. “Well, put your boots on. You’ll catch a death cold a-tromping around in the wet. And hurry on back, you hear?” Ma says. Ma’s words make me grin. She’s always a-trying to teach me to cook and help in the house, and I’m getting right good at ironing a shirt, but housework ain’t for me. I got to be outside. I climb up the hill where I can see up and down the river real far. Finally I’m standing on the rise ’bout two hundred yards from our place looking at our house and a half-mile up and downriver. Pa built our place way up from the bottomland, but now I’m a-wondering if anywhere is high enough. While we slept, all up and down as far as I can see, the New has spread to its full girth and then some, taking on a wide path across the bottoms and soaking halfway up the birch tree not a hundred yards from our barn. I look down at the only house I’ve ever known. Pa bought the land it sits on before him and Ma hitched up. It weren’t but one big room to start out with. Over the years Pa kept adding on and fixing it up. He put in a side addition for him and Ma’s bedroom and boarded up the rafters in the attic, so it would look like a real room for any young’uns what might come along. He even leaned the roof to make a fine front porch so Ma could set and watch the river pass by. It still don’t look much, but at least Pa keeps them outside weatherboards whitewashed. Yes, that old house down there is right cozy. Don’t much rain leak through the tin roof, and the wood stove what sets in the kitchen keeps us all toasty warm until the wood burns up during the night. Them floors is mighty cold on bare feet in the mornings. I pull Pa’s slicker a little tighter around me to ward off the chill of the morning. Reckon Ma is right. Without these boots my toes would be stone blue-cold right now. I’ll turn eight in April and, in all my years of watching this river, I’ve never seen nothing like it is now. I’ve heard stories all my life ’bout it flooding up toward the New River Gorge, but never anything like this around here. The sight of it is a-making me feel right skittish. Perched here on this hill, I watch as Pa walks out on the porch. He tucks one hand up under his arm and scratches his day-old beard with the other hand. Pondering is what he’s a-doing. He told Ma while they was eating oatmeal a few minutes ago that we might all better pack up a few things and head up to higher ground, maybe go the two miles upriver to Aunt Pearlie’s. A commotion upriver brings my thinking back to the here and now. It’s getting louder and louder. Sounds like a wheat thrashing machine a-starting up. And what’s that smell? The scent of pinesap clings to my nose hairs, just like when Pa cuts down a pine for firewood. Lord, have mercy! I ain’t believing what I’m a-seeing. There comes a wall of water pushing downriver, and it’s a-popping trees in two like they is twigs. Sounds like limbs a-cracking during an ice storm. ’Cept there ain’t no ice on the trees. All that ice is in the river, big thousand-pound chunks a-speeding right for me. Wow! I can’t wait to read the rest! I’m hooked already! Can’t wait for the book!